The iodine nutritional status of a population is mainly measured by urinary iodine excretion (UI) and thyroid volume determined by ultrasound (US). The surveillance of nutritional iodine levels in the Mexican population has been insufficient. Our aim was to determine the UI in random samples from adults living in an urban area. We selected a sample of healthy individuals over the age of 18 that were students, physicians or administrative personnel at our Institution and had no known thyroid disease. Thyroid volume was determined by ultrasound in all volunteers as well as thyroid hormones and antithyroid antibodies and a urine sample was obtained. One hundred and two volunteers with a median age of 29, participated in the study. The group’s median UI was 221 μg/L,interquartile range(IQR)(135.0 to 356.8) and no differences were observed between genders: women had a UI of 218.0 μg/L IQR (129.0 a 351.0) vs. 223.0 μg/L IQR (138.0 to 374.0) in males, p 0.941. Excessive dietary iodine intake was established in 31.4% of all volunteers according to their UI, placing them at risk of thyroid dysfunction. It is fundamental to evaluate the national iodine nutritional status in Mexico. We discuss the current status of the nutritional state in the Americas, emphasizing that in Latin America and the observed tendency in the region to ingest a diet high in iodine. Key words: Urinary iodine; iodine intake; iodine excess; Latin America; iodized salt. El estatus nutricional del yodo en una población, principalmente es medido por la excreción del yodo urinario (UI) y el cálculo del volumen tiroideo por ultrasonido (US). La vigilancia nutricional del yodo en la población en México ha sido escasa. El objetivo fue determinar la UI en una muestra casual en adultos sanos que habitan en un área urbana. Se seleccionó una muestra de individuos mayores de 18 años, entre estudiantes, médicos y trabajadores administrativos de nuestra institución, sanos, sin enfermedad tiroidea conocida. A todos los voluntarios se les determinó el volumen tiroideo por US, hormonas y anticuerpos antitiroideos y se les solicitó una muestra de orina.Participaron 102 voluntarios, mediana de 29 años. La mediana de la UI del grupo fue 221 μg/L, rango intercuartílico(RIQ) (135.0 a 356.8), no hubo diferencias entre géneros, las mujeres tuvieron una UI de, 218.0 μg/L RIQ (129.0 a 351.0) vs 223.0 μg/L RIQ (138.0 a 374.0) p 0.941. El 31.4% de los voluntarios mostraron una ingestión excesiva de yodo en la dieta de acuerdo a la UI, lo cual los coloca en riesgo de sufrir disfunción tiroidea. Es necesario considerar la evaluación Nacional del estatus nutricional del yodo, en México. En el artículo se discute la situación actual del estatus nutricional en las Américas, haciendo énfasis en Latinoamérica y a la tendencia de la región a la dieta excedida en yodo. Palabras clave: Yodo urinario; ingestión de yodo; exceso de yodo; Latinoamérica; sal yodada. Iodine is a most important nutrient, necessary for the production of thyroid hormones. Thyroid hormones and hence iodine, are essential to mammalian life (1). Iodine deficiency leads to various deleterious effects on health, all secondary to the inadequate production of thyroid hormones; they have been grouped and named “iodine deficiency disorders” (IDD)(2). Deficiency during pregnancy and infancy lead to irreversible growth abnormalities as well as altered brain development and growth; it is still the most common cause of preventable brain damage and mental deficiency worldwide (1). The most common way of following and verifying an adequate dietary iodine intake, is by measuring urinary iodine (UI) since over 90% of dietary iodine is excreted in the urine and its concentration is an excellent biomarker reflecting recent dietary iodine intake(1). 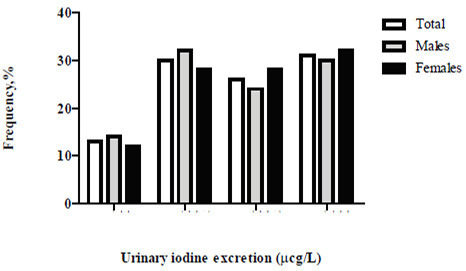 The UI in spot urine obtained from a representative sample and expressed as a median value, is the recommended method to evaluate nutritional iodine status in a given population(2). In the early XXth century, iodine deficiency was recognized as a public health issue in many Latin American countries and led to the legislation of salt iodization in many of them between the 1950s and the 1970s(3). However, the lack of surveillance of UI in several Latin American countries as well as the lack of standardization of UI measurement methods but rather only the reliance on thyroid palpation, led to the inclusion of Latin America in the ThyroMobil project in 1999, sponsored by the International Council for Control of Iodine Deficiency Disorders (ICCIDD) and Merck KGaA Company. This study evaluated 13 Latin American countries, including Mexico. In our country, only 23 populations previously known to be iodine deficient, were studied (“sentinel sites”); the registered median UI was 176 μg/L(3). The Mexican National government has only conducted national UI measurements in children under 12 years of age and in non-pregnant women between the ages of 12 and 49 as part of the National Nutrition Survey in 1999 (Encuesta Nacional de Nutrición 1999 (ENN-99)); however, the reported results only confirmed the presence or lack of iodine deficiency among children aged 5 to 12, 91.5% of whom had a UI > 100 μg/L and were thus, not iodine deficient. 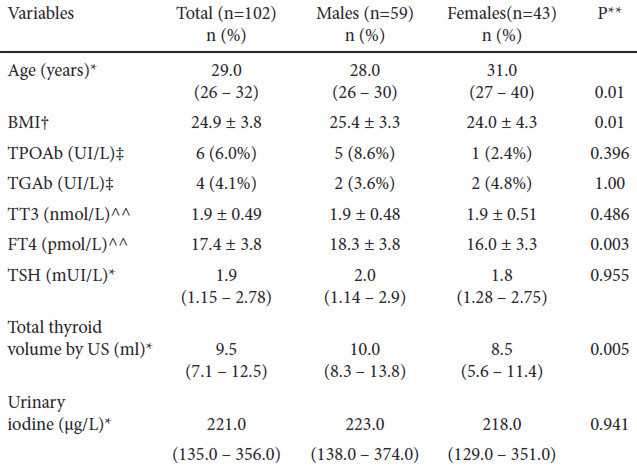 In non-pregnant women between the ages of 12 and 49, the UI median value was 281 μg/L(4). The aim of our study was to evaluate UI in spot urine, in a group of healthy adults living in a metropolitan area of Mexico. This is a cross-sectional study with a nonprobabilistic sample that included healthy volunteers over 18 years of age, with no previous history of thyroid disease, not currently pregnant or breastfeeding. We selected subjects randomly;were recruited among the administrative, nursing and resident personnel of our hospital. All volunteers signed an informed consent form in order to enter the study. They also completed a questionnaire on any family history of thyroid disease, their personal pathological history and comorbilities and the use of drugs or iodinated contrast agents for radiological studies. Volunteers that had been exposed to iodinated products or substances within the previous 12 weeks were excluded. All participants underwent a thyroid ultrasound with portable equipment and a lineal 7.5 MHz transducer, conducted by a single investigator (AFR); this evaluation was conducted before every thyroid physical examination and before the operator had access to each volunteer’s information. The volume of each thyroid lobule was calculated using the following formula: width x height x length x 0.52, whereby the sum of both lobules equals the thyroid volume. Nodular changes over 5 mm were considered thyroid nodules. There is no data in the literature on the thyroid volume reference values in the adult Mexican population, so we defined goiter as a thyroid volume above the 97.5th percentile of the data distribution. All volunteers were examined by the same experienced endocrinologist. A venous blood sample was obtained from all volunteers after a fast of at least 8 hrs, between 0700 and 1000 h; after centrifugation, serum was aliquoted and frozen at -20° C until analysis. Urine samples were obtained in 100 ml collection vials before noon and were then transferred into 5 ml vials and frozen in the laboratory at -20°C, until processing. The epidemiological criteria used to evaluate the iodine nutritional status based on the median UI were as follows: < 99.0 μg/L equaled a deficient intake, 100 to 199.0 μg/L reflected an adequate iodine intake, 200 to 299.0 μg/L suggested a more than adequate iodine intake and > 300.0 μg/L was compatible with excessive iodine intake(2). Free T4 (FT4), total T3 (TT3),Thyroid peroxidase antibody(TPOAb) and Thyroglobulin antibody (TgAb) concentrations were measured in serum by radioimmunoassay (RIA). FT4 had an analytical sensitivity of 0.65 pmol/L, a normal range of 9.0 – 23.2 pmol/L, an intraassay coefficient ofvariation (CV) < 8.15% and an inter-assay CV< 14.9%. The TT3 assay had an analytical sensitivity of 0.15 nmol/L, a normal range of 0.9 – 2.9 nmol/L, an intra-assay CV < 12% and an inter-assay CV< 10.1%. TgAb had an analytical sensitivity of 2.0 IU/ml, values below 30 IU/ml were considered normal, the intra-assay CVwas < 8.3% and the inter-assay CV was 12.8% (RIA-gnost® FT4, RIA-gnost® T3, TGAB ONE STEP®; Cisbio Bioassays, France). The assay used for TPOAb determinations had an analytical sensitivity of 1.9 IU/ml, values below 100 IU/ ml were considered normal. The intra-assay CV was < 9.31% and the inter-assay CV was < 12.4% (Anti-hTPO RIA KIT®, Izotop Budapest, Hungary). Thyrotropin(TSH) was analyzed by immunoradiometric assay (IRMA); its analytical sensitivity was 0.005 mIU/L, the normal range was 0.3 to 4.0 mIU/L, the intra-assay CVwas < 4.0% and the inter-assay CV was < 3.5% (Turbo TSH 125I IRMA KIT® Izotop Budapest, Hungary). Measurement of UI was obtained by spectrophotometry with the kinetic microplate method based on the Sandell-Kolthoff reaction; results were expressed as μg/L and were processed in the Nutritional Biochemistry Laboratory of the Instituto de Nutrición de CentroAmérica y Panamá (INCAP)/International Resource Laboratories for Iodine Network (IRLI)-Guatemala. This study was approved by the Ethics Committee of the Instituto Nacional de Ciencias Médicas y Nutrición “Salvador Zubirán”. Nominal categorical variables are presented as frequencies and proportions. The distribution of continuous numerical variables was analyzed with the Kolmogorov-Smirnov and the Shapiro-Wilk methods; those with an abnormal distribution are reported as medians and interquartile ranges (IQR). Group comparisons were analyzed with Student’s independent t test, Fisher’s exact test and Mann-Whitney’s U test, as appropriate. In all statistical analyses, a P < 0.05 was considered statistically significant; the statistical SPSS 15.0 (Chicago IL, USA) software package was used. We recruited 102 volunteers, all among the administrative and academic personnel of the Instituto Nacional de CienciasMédicas y Nutrición “Salvador Zubirán”; all had lived in Mexico City at least for the past 6 months. The total population was young, with a median age of 29 and only 13.7% were above age 40; men predominated over women (42.1%) and the population’s characteristics are shown in Table 1. * Values in medians and Interquartile range. † BMI: Body Mass Index, values in mean and SD. ‡ Presence of antibodies in significant numbers. ** Fisher’s Exact Test, Mann-Whitney’ U test and Student’s independent t test, as appropriate. TPOAb: Thyroid anti-peroxidase antibodies, TGAb: Anti-Thyroglobulin antibodies; TT3: total T3; FT4: free T4; TSH: Thyrotropin; US: Ultrasound. Physical examination revealed that most volunteers had a normal thyroid gland; goiter was detected in only 0.1% and a nodule was palpable in 3.1% of all volunteers. More thyroid nodules were detected by ultrasound, 10.2%, and they were more frequent in females than in males: 15.0 vs. 6.9% (p 0.309). Diffuse goiter was detected in 2.0% of volunteers with this method. Table 2 details the stratified dietary iodine intake according to the excretion of the UI (WHO/ICCIDD)(2). Median UI in the total group was 221 μg/L and 31.4% of volunteers had excessive iodine intake; only a third of participants had an optimal diet in terms of iodine intake according to their UI (Figure 1). In our country, a national survey on UI excretion has not been conducted since 1999. During these past 15 years, only occasional isolated studies have been performed in some regions of the country, most of which have focused on the search for iodine deficiency in known populations and to confirm the iodine deficiency reported in previous studies (“sentinel sites”) (5-7). These efforts are commendable but results are disparate, displaying a mosaic in terms of UI excretion in these regionsthat range from deficiency to excess (see Table 3). Unlike these studies, our project analyzes for the first time, a characteristic urban, adult, healthy population that reflects, as a median, an overall more than adequate iodine intake fostering inpredisposed individuals, the risk of developing hyperthyroidism, thyroiditis, goiter, hypothyroidism or autoimmune thyroid disease(1). The studied population had no particular characteristics; the detection of positive anti-thyroid antibodies was lower or similar to that reported in other epidemiological studies. There were no differences between genders perhaps due to the predominance of males in the group as well as the population’s young age, which decreases the possibility of detecting autoimmune thyroid disease (8). An unusual finding that has nevertheless been described by some authors, was an increased FT4 concentration in males compared to females. The ultrasound findings in our group are comparable to those obtained in populations with a sufficient or an excessive dietary iodine intake. Thyroid volume has always been considered a reflection of the individual’s iodine nutritional status in analyzed populations; in iodine sufficiency, median values are about 10 ml as in our group, and the detection of nodules is less frequent as well as that of goiters; if detected, goiters tend to be diffuse and the presence of multinodular goiters is rare (9). ‡The iodine nutrition status in pregnant women was determined according to the recommended WHO/ICCIDD criteria: Insufficient iodine intake was defined as UI <150μg/L, adequate intake of iodine as UI 150-249μg/L; iodine intake above the Requirements as UI 250-499μg/L and excessive intake of iodine as UI >500μg/L. Fifty-seven percent of the volunteers studied in this work, had a higher urinary iodine, UI was greater than 200 μg/L, reflecting above optimal iodine intake. This phenomenon is being more frequently reported in the literature and has also surprisingly, become more common in our region (Latin America) suggesting that it may be associated to the country’s socioeconomic conditions directly influencing nutrition. Since the publication of the ThyroMobil results in 2004, Chile, Ecuador and Brazil have reported median UI values > 300 μg/L although Chile was an exception, since 100% of their studied individuals had a UI > 300 μg/L (median 540 μg/L). Venezuela, Paraguay, Honduras and Peru reported UI between 200 and 299 μg/L, reflecting a more than adequate dietary iodine intake (4). Out of 13 countries evaluated in that study, over half of them had excessive iodine in their diet. In his last report, the ICCIDD coordinator for Latin America determined that out of 22 countries in the region, 13 had a median UI > 200 μg/L; however in the data presented, 8 countries had not conducted a national survey within the previous 8 years, including Mexico(10).But in the past decade, several local reports of national and nonnational surveys have been published, reflecting a clear tendency to an excessive dietary iodine intake in Brazil (11), Colombia (12), Paraguay (13), Chile (14), Peru (15), Cuba (16) and the Dominican Republic (17). In the latest National Health and Nutrition Examination Survey (NHANES), discrepancies have been detected between infants, women in reproductive age ranges and pregnant women. In children, median UI has remained stable over the past few years and even above the optimal intake levels; the sub-group of pregnant women, however, proved to be iodine deficient in the last NHAHES 2005-2010(18), with a median UI of 129 μg/L (adequate iodine intake during pregnancy is reflected by UI > 150 μg/L). This worrisome discrepancy has also been observed in other countries such as Thailand, China and India (19). Our study did not include pregnant women, but the small group of studied women was in the reproductive age group and their nutritional status reflected a more than adequate iodine intake, similar to that reported in the National Nutrition Survey in 1999(ENN-99)(4) and in a recent study of pregnant Mexican women (20). (See Table 3) This inconsistency has been explained by the infants’ large milk intake (19). These findings are most relevant since characteristically, schoolchildren were considered representative of the general population’s nutritional status, but this may not always be so (19); the inclusion of adults should be compulsory in national surveys, and particularly that of pregnant females and women in reproductive age. These discrepancies have not been observed in Latin America or in Mexico. Some authors have suggested this may occur in countries whose primary iodine source is salt (19), but Latin American reports that have studied and recorded house salt iodination reveal that salt iodination is within normal to lower limits, explaining the determined UI levels in these populations (5, 15); possibly, these UI values are a result of a diet rich in processed foods or fortified with micronutrients, including iodine, or the iodine added to salt during processing. This is a well-known observation in developed countries where over 80% of ingested salt comes from processed foods (19). The amount of ingested iodine increases if iodinated salt is used. The use of iodinated salt in the food industry may be voluntary or compulsory, and depends on the sanitary legislation of each country; in Mexico, its use is obligatory in processed foods. Worldwide surveillance of iodine nutritional status has not been totally appropriate. In spite of awareness of the deleterious effects of iodine deficiency or excess on health, we have seen over the past years how developed countries that had eliminated iodine deficiency, now harbor populations with iodine deficiency, including Australia, New Zealand, United Kingdom and the USA (19-22); in the USA, this is particularly true in pregnant women. This reflects the need for permanent surveillance and intervention in the nutritional iodine status; few countries persistently monitor their populations and even countries with a prestigious background in public health such as the United Kingdom, have not conducted an appropriate UI excretion national survey in the past 60 years; moreover, most of the table salt for sale in their supermarkets contain insignificant iodine quantities (22, 23). Some limitations to the interpretation of our results should be considered. These limitations are mainly related to the small numbers of volunteers and the type populations included in the analysis. Despite these limitations, the present study provides some important contributions;our results are similar to those previously reported by others in Mexico within the past 15 years and after the national UI excretion survey and the ThyroMobil report. There is a tendency toward excessive dietary iodine intake, a phenomenon repeated in most countries in the Latin American region. Authorities in our countries should update their national surveys and include not only children but pregnant women and those in reproductive age, due to the observed discordant results in these sub-groups in other countries. Aside from updating these surveys every 3 to 5 years, necessary interventions in the national and regional norms on salt iodination according to the population’s UI excretion should be regularly implemented. We gratefully acknowledge Ms. Carolina Martínez from the Nutritional Biochemistry Laboratory of the Instituto de Nutrición de CentroAmérica y Panamá (INCAP)/International Resource Laboratories for Iodine Network (IRLI)-Guatemala, for urinary iodine determinations. Zimmermann MB. Iodine deficiency. Endocr Rev 2009;30:376-408. World Health Organization. Assessment of iodine deficiency disorders and monitoring their elimination. 3rd edition.Geneve: WHO; 2007. 107 p.
Pretell EA, Delange F, Hostalek U, Corigliano S, Barreda L, Higa AM, Altschuler N, Barragán D, Ceballos JL, González O, Jara JA, Medeiros G, Montes JA, Muzzo S, Pacheco VM, Cordero L. Iodine nutrition improves in Latin America. Thyroid 2004;14:590-599. Rivera JA, Shamah-Levy T, Villalpando S, Gonzalez T, Hernandez B, Sepulveda J. Encuesta Nacional de Nutrición 1999. Estado Nutricio de Niños y Mujeres en México. 1st Edition. México: Instituto Nacional de Salud Pública; 2001. Pineda-Lucatero A, Avila-Jimenez L, Ramos-Hernandez RI, Magos C, Martinez H. Iodine deficiency and its association with intelligence quotient in schoolchildren from Colima, Mexico. Monarrez-Espino J, Greiner T. Iodine nutrition among indigenous Tarahumara schoolchildren in Mexico. Eur J Clin Nutr 2005;59:1213-1216. Garcia-Solis P, Solis-S JC, Garcia-Gaytan AC, Reyes-Mendoza VA, Robles-Osorio L, Villarreal-Rios E, Leal L, Hernández HL. Iodine nutrition in elementary state schools of Queretaro, Mexico: correlations between urinary iodine concentration with global nutrition status and social gap index. Arq Bras Endocrinol Metabol 2013;57:473-482. Hollowell JG, Staehling NW, Flanders WD, Hannon WH, Gunter EW, Spencer CA, Braverman LE. Serum TSH, T(4), and thyroid antibodies in the United States population (1988 to 1994): National Health and Nutrition Examination Survey (NHANES III). J Clin Endocrinol Metab 2002;87:489-499. Carlé A, Krejbjerg A, Laurberg P. Epidemiology of nodular goitre. Influence of iodine intake. Best Pract Res Clin Endocrinol Metab 2014;28:465-479. Pretell EA, Grajeda R. Iodine Nutrition in Latin America. THE IDD NEWSLETTER [Internet] 2009 Feb[cited 2014 Mar 31];31(1):[about 5p. ].Available from: http://www.iccidd.org/p142000428.html. Camargo RY, Tomimori EK, Neves SC, Rubio GS, Galrao AL, Knobel M, Medeiros-Neto G. Thyroid and the environment: exposure to excessive nutritional iodine increases the prevalence of thyroid disorders in Sao Paulo, Brazil. Eur J Endocrinol 2008;159:293-299. Gallego ML, Loango N, Londono AL, Landazuri P. Urinary iodine excretion levels in schoolchildren from Quindio, 2006-2007. Rev Salud Publica (Bogota ) 2009;11:952-960. Jara JA, Pretell EA, Zaracho J, Goetting S, Riveros C. Prevalence of endemic goiter with the ultrasonographic method, determination of urinary iodine and dosage of iodine content of salt in schools of Paraguay. Rev Chil Nutr 2004;31:287-295. Muzzo S, Pretell EA, Bueno, F., Muñoz, C. Iodine nutrition in school children of Calama city, Chile: persistence of high urinary iodine levels. Rev Chil Nutr 2013;40:33-38. Higa AM, Miranda M, Campos M, Sanchez JR. Iodized salt intake in households and iodine nutritional status in women of childbearing age in Peru, 2008. Rev Peru Med Exp Salud Publica 2010;27:195-200. Terry B, Zulueta D, De la Paz M, Rodríguez A, Alavez E, Turcios S. Iodine deficiency in Cuba. Rev Cubana Hig Epidemiol 2013;51:242-254. Caldwell KL, Pan Y, Mortensen ME, Makhmudov A, Merrill L, Moye J. Iodine status in pregnant women in the National Children’s Study and in U.S. women (15-44 years), National Health and Nutrition Examination Survey 2005-2010. Thyroid 2013;23:927-937. Pearce EN, Andersson M, Zimmermann MB. Global iodine nutrition: Where do we stand in 2013? Thyroid 2013;23:523-528. Garcia-Solis P, Solis-S JC, Garcia-Gaytan AC, Reyes-Mendoza VA, Robles-Osorio L, Hernandez-Montiel HL, et al. Iodine nutrition status in pregnant women in Mexico. Thyroid 2011;21:1367-1371. Li M, Eastman CJ, Waite KV, Ma G, Zacharin MR, Topliss DJ, Harding PE, Walsh JP, Ward LC, Mortimer RH, Mackenzie EJ, Byth K, Doyle Z. Are Australian children iodine deficient? Results of the Australian National Iodine Nutrition Study. Med J Aust 2006;184:165-169. Vanderpump MP, Lazarus JH, Smyth PP, Laurberg P, Holder RL, Boelaert K, Frankiyn JA. Iodine status of UK schoolgirls: a cross-sectional survey. Lancet 2011;377:2007-2012. Lazarus JH, Smyth PP. Iodine deficiency in the UK and Ireland. Lancet 2008;372:888.